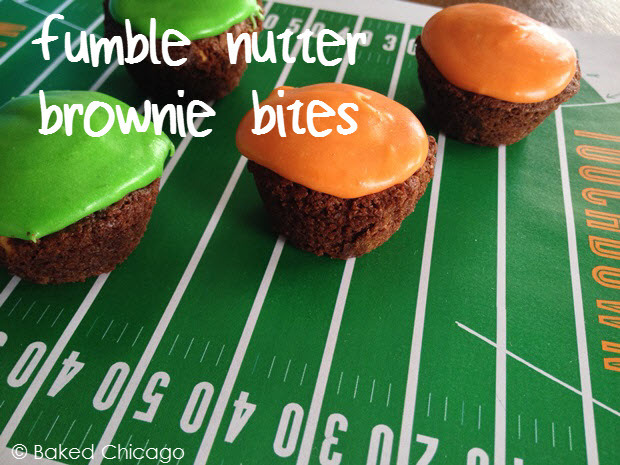 Football Fumble Nutter Brownie Bites will bowl over your Game Day guests! 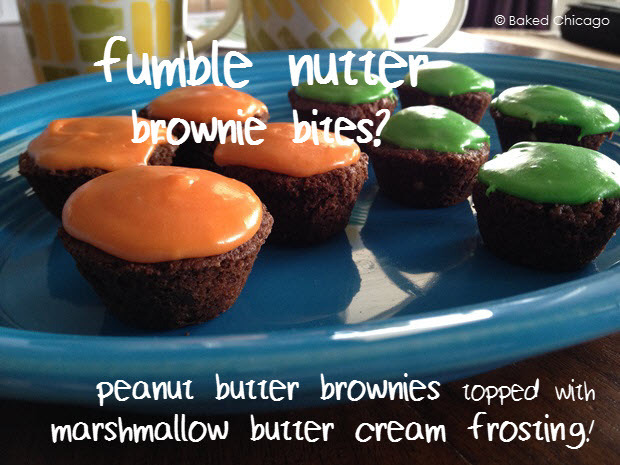 Home » Desserts » Football Fumble Nutter Brownie Bites will bowl over your Game Day guests! You might have heard that there’s a small football game happening this Sunday. Not a big match up at all. Just some teams from Colorado and Washington state getting together for a quick game. NOT! It’s amazing what a big cultural phenomenon and big business the Super Bowl is in the United States. 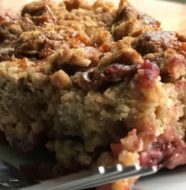 At the heart of it, football is a team sport and big game days like the Super Bowl are best shared with friends and family. 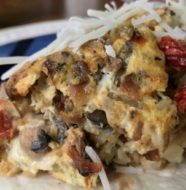 Like the 100+ million others who will be watching the Big Game (and I freely admit I like the commercials and half-time show best), I hoping to cook up some fun foods that will be enjoyed by all, but are also easy-to-make with little or no cleanup. That’s my kind of game day victory! 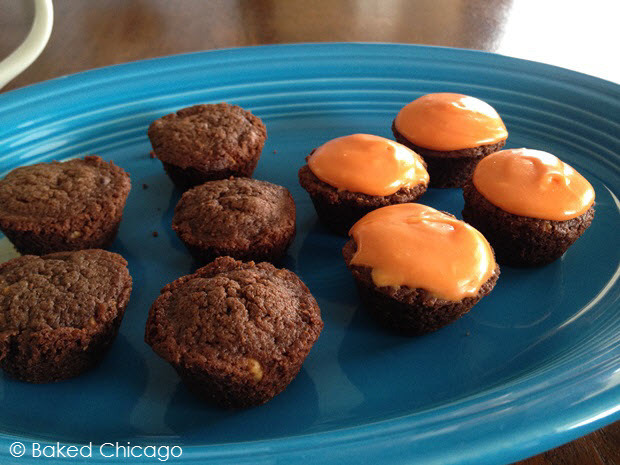 This year I decided to do a twist on one of my classic brownie recipes from Baked Chicago’s Simply Decadent Brownies cookbook, and have some fun with Seattle green- and Denver orange-colored butter cream frostings. 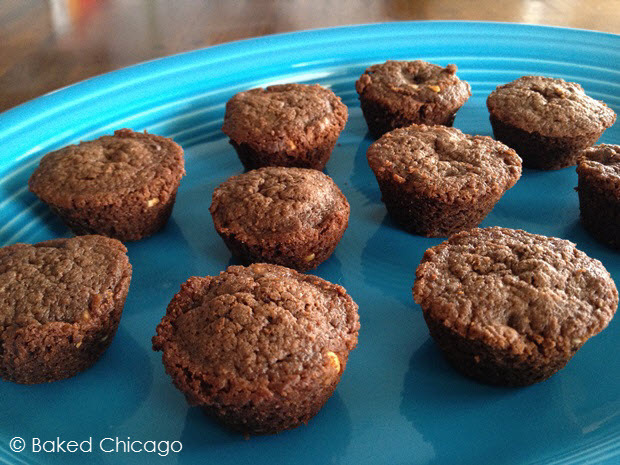 Football Fumble Nutter Brownie Bites? 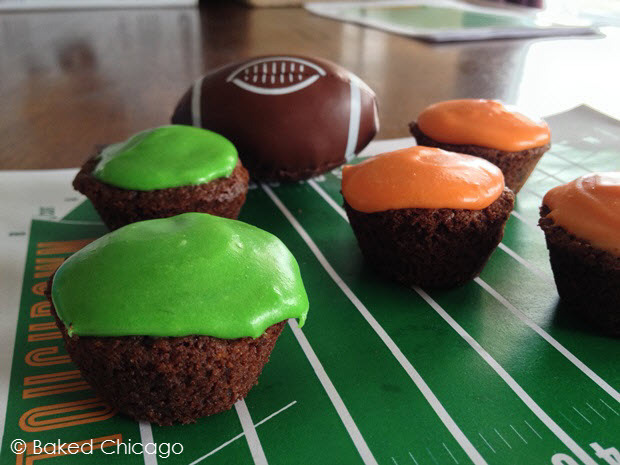 To add some fun for Game Day and to make it easy to eat (and hard to ‘fumble’ up), I decided that brownie bites were the perfect size for a sweet snack and to frost half of the brownies each with orange- or green-colored frosting to cheer on Denver and Seattle. I haven’t decided yet who I’m rooting for, but I’m leaning toward the Broncos. What do you think about that choice? Will I be crying in my brownies at the end of the game or doing an end zone dance in victory? 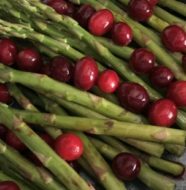 Follow the directions on your food color packaging to get the right shades of green and orange. 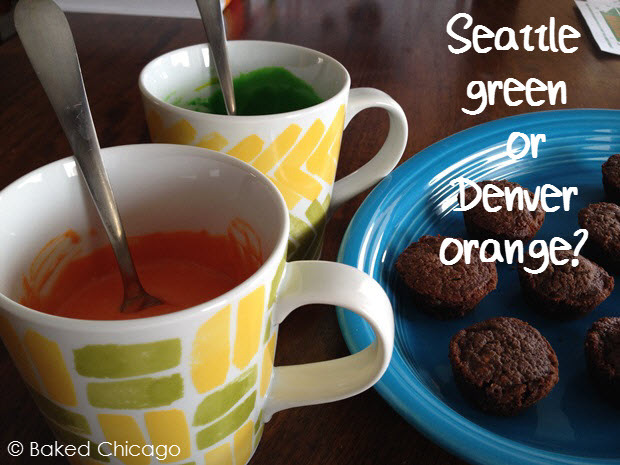 After I made the frosting, I divided it into two coffee cups and from there added the food coloring.